AT&T’s Randall Stephenson is making big moves to shore up his company’s digital future. During its antitrust trial this year, AT&T described itself as a legacy TV company struggling to compete with tech giants like Google that are totally upending its advertising businesses and competing for the time and attention of the same audiences. Now that those regulatory issues are resolved, AT&T is taking the Alphabet-owned company head on. AT&T announced today (June 25) plans to buy ad-tech firm and Google competitor AppNexus, in a deal reportedly valued around $1.6 billion (paywall). The acquisition is meant to strengthen AT&T’s ad business and make its TV advertising more competitive against digital offerings. TV advertising, once the bulk of advertising revenue globally, recently hit a wall. In 2017, advertisers spent more on digital advertising than TV for the first time, as they flocked to services like Google and Facebook with robust ad platforms that make it easy to target users around the world. 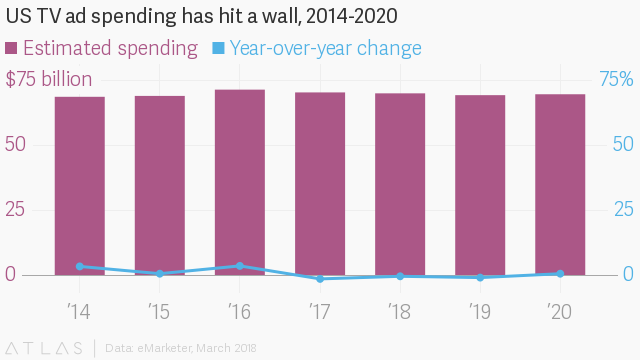 Google and Facebook now make up nearly 60% of ad spending in the US, the world’s largest advertising market. AppNexus, a New York-based firm founded by online ad veterans and co-run by an alum of Google’s DoubleClick, has positioned itself as a badly needed alternative to the “duopoly,” as Google and Facebook have become known in the advertising industry. AppNexus claims its ad buying platform is more convenient for large advertisers than Google’s because it automates the usually manual process of bidding for ads online. The company has also been expanding more into online video advertising, making it a good fit for AT&T, as it owns satellite provider DirecTV and Time Warner, now WarnerMedia, TV channels. AT&T has reportedly been working on an ad product that would allow it to personalize TV ads to its viewers, based on their households and smartphone data, in order to compete with Google and Facebook. AT&T came out of the gate running after receiving regulatory approval to buy Time Warner earlier this month. It swiftly closed the deal and launched a low-cost, sports-free streaming service, called WatchTV. Its purchase of AppNexus brings AT&T firmly into the digital era.